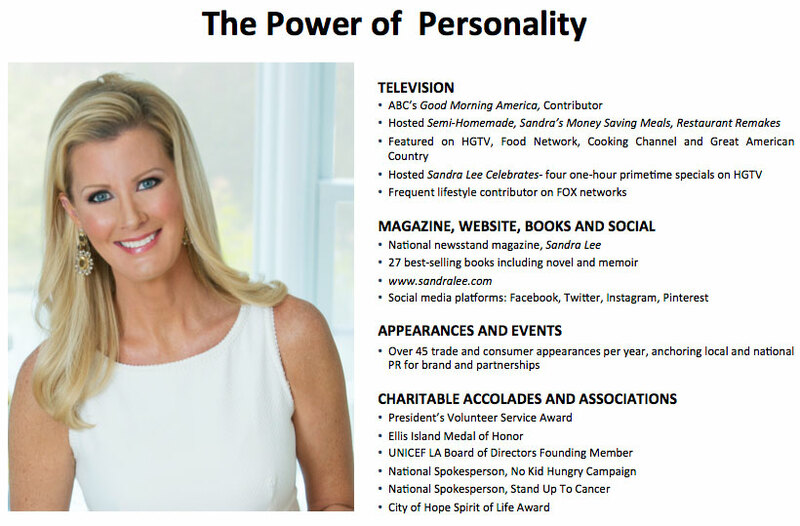 Sandra Lee is a Gracie and multiple Emmy® Award-Winning advocate, activist, philanthropist and an internationally acclaimed home life expert. She is a best selling author of 27 books and the Editor in Chief of Sandra Lee Magazine and Sandralee.com. During her inspiring career, she created/hosted numerous highly-rated television programs broadcast on ABC, NBC, FOX, Food Network, HGTV, Discovery Family, and Cooking Channels with airings in 63 countries worldwide. For decades, Sandra has worked on causes close to her heart and been recognized with the President’s Volunteer Service Award, the Eleanor Roosevelt Medal of Honor, the Albert Einstein Award of Excellence and the Ellis Island Medal of Honor. In 2000, Sandra was one of three founding Board Members of UNICEF®’s Los Angeles chapter and was given UNICEF’s Special Appointment of Nutrition Emissary in 2015. For a decade, she served as the national spokesperson for the No Kid Hungry campaign and is a dedicated family member to God’s Love We Deliver/Project Angel Food and the Elton John’s AIDS Foundation. Sandra’s open, uncensored communications has been acknowledged with several prestigious honors including Capitol Hill’s Congressional Families Excellence in Cancer Awareness Award, City of Hope’s Spirit of Life Award, and The Creative Coalition’s Television Industry Advocacy Award. Follow @sandraleeonline for daily updates. Keep up with Sandra Lee on Facebook!